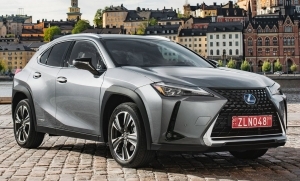 Lexus UX. 2018 to date (prod. n/a). 5-door SUV. F/F, F/A, 1987 cm³ petrol, 1987 cm³ petrol–electric hybrid (I4 DOHC). Smallest crossover in the Lexus range when launched, slotting under NX and related to the Toyota C-HR. Height kept to 1,540 mm, mindful of multi-storey car parks. Easy to manœuvre, with quality cabin. Models with adaptive suspension minimized body roll, though standard suspension already very competent thanks to the stiffness of the platform.